Is your insurance adjuster running away with hundreds of your workers' comp dollars every week? | Donahoe Kearney, LLP Mr. Hayes, Washington, DC. There are things that you need to know about your workers' compensation claim that your insurance adjuster will never tell you. 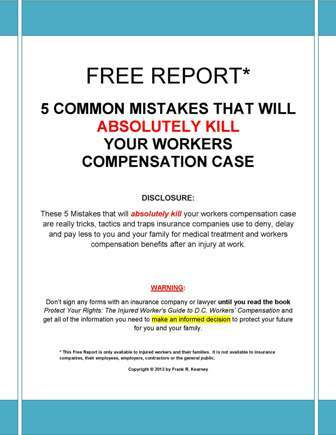 Protect Your Rights: The Ultimate Guide to D.C. Workers Compensation is the only book written just for injured workers and their families in the DMV. Written by a nationally-recognized, board-certified civil trial attorney who used to represent insurance companies but for over 20 years now has been helping people just like you. This book exposes the insurance company traps, tricks and tactics that can ruin your case (and quickly). This book is not available to insurance companies, their employees, or their lawyers. The new and improved second edition is a must-read for anyone with a serious work injury. -Discover the truth about terms like "independent medical exam." When your livelihood, your health, and your future are at stake, you need to know the facts. You need to know your rights and how to protect yourself and your family. Of course, it can’t tell you everything you need to know and it certainly doesn’t substitute for having us as your attorneys, because each case is different. But this book can get you started on the right track - avoiding the mistakes the insurance company wants you to make, and understanding more about the complicated, specialized workers' compensation system you're now in. This book is offered as a free gift ONLY to workers who have been injured on the job, and their families, in DC, Maryland and Virginia. If you were seriously hurt on the job, don't wait another minute. One mistake could literally cost you $408.00 each week, and the insurance company knows it. Learn how to avoid this and other insurance company traps. Don't lose everything you have worked for after an injury! Order this book and call us today at (202) 393 - 3320.